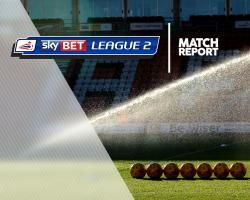 Defences were very much on top at Mansfield as Colchester chalked up a third clean sheet in a row in a 0-0 draw. A tight first half, short on quality, saw few chances at either end. Matt Green might have put Mansfield ahead on 12 minutes but pulled a low finish wide from eight yards, while Ashley Hemmings and Mal Benning also fired wide. Colchester produced the game's first effort on target on 24 minutes when Kurtis Guthrie headed Owen Garvan's free-kick at Scott Shearer. On 41 minutes Garvan then forced Shearer down to his right to turn away a low 25-yard effort. The second half saw even fewer opportunities with the Stags dominating the pressure but unable to find a finish. Green turned just outside the box to force Sam Walker to save his low finish and headed another good chance over four minutes later from Lee Collins' cross. Krystian Pearce was relieved to see Shearer reach his short backpass first with two minutes left and in the last minute a Tom Eastman header from almost on the by-line dropped onto the top of the home crossbar.